Let’s celebrate National Dairy Month with Florida Milk and a Boozy Hazelnut Frozen Hot Chocolate like no other! Food holidays are a great reason (excuse) to get friends together and celebrate! 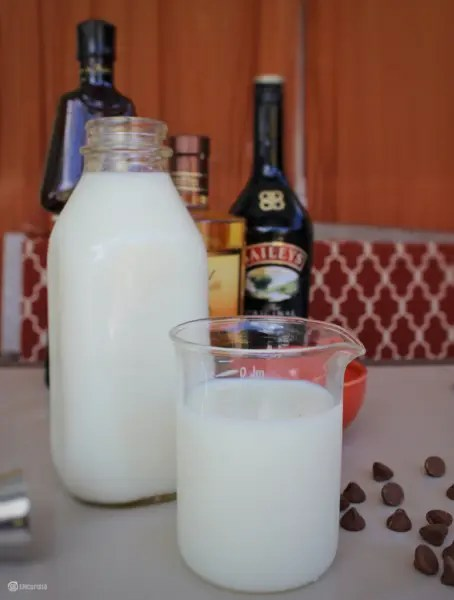 Since June is National Dairy Month, what better way to celebrate than to join my friends of the Sunday Supper Movement and Florida Milk and create a Boozy Hazelnut Frozen Hot Chocolate to share with you. 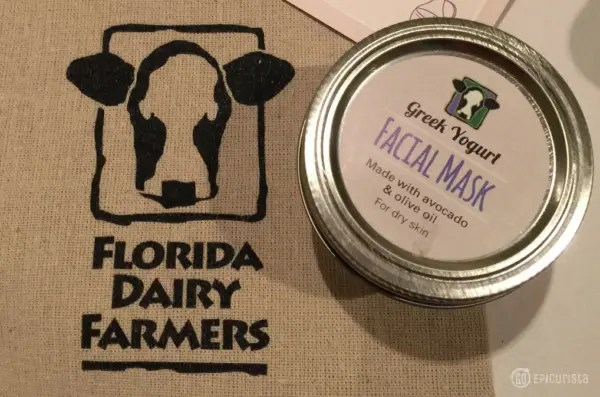 In the process of my research for this campaign, especially after meeting the lovely people behind Florida Milk at this year’s Sunday Supper Food Wine Conference, I learned so much about this important staple of our daily diet. I was surprised I had many misconceptions about milk, discovered new ways to use dairy, and realized how sometimes a simple frozen hot chocolate can be so much more than a sweet treat. Seriously, so much more! Lactose Intolerance is not what you think. It’s common to assume if you’re lactose intolerant, you should not drink cow’s milk. I was surprised to read on the Florida Dairy website you can have Lactose-free milk, which is regular milk but with the sugar (lactose) already broken down. This is good news because no one should miss this boozy frozen hot chocolate recipe or a nice glass of milk and cookies. These are some of life’s greatest treats! 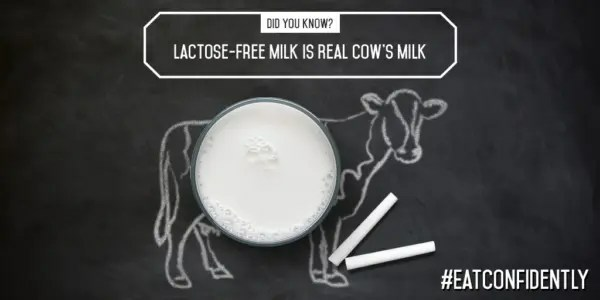 Check out Florida Milk in the news for more interesting facts. You may find a few surprises of your own. Have you ever wondered how many billion pounds of milk are produced in Florida? 123,000 Florida dairy cows collectively produce about 2.34 billion pounds of milk a year! Wow! That’s 277 million gallons of Florida-produced milk in the grocery store. Each Florida dairy cow produces about 6-8 gallons of milk each day and is milked 2-3 times per day. That’s a lot of frozen hot chocolates! Click to learn more about life on the Florida Dairy Farm. “Milk does a body good” I’ve always heard that phrase and now I know why. Milk contains 9 essential nutrients and vitamins: protein, vitamins A, D, and B12, calcium, potassium, phosphorus, riboflavin, niacin, zinc, and magnesium. 3 cups of milk a day will give you the recommended daily allowance for dairy. (One of these boozy frozen hot chocolate treats will get you a quarter of the way there! Drink up! 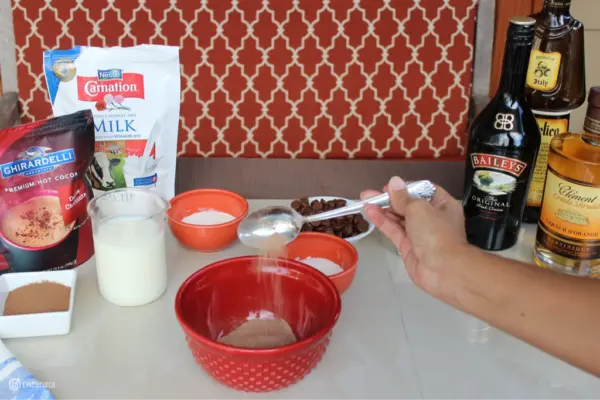 Florida Milk in Schools: Moms will appreciate how Florida milk is part of school nutrition. Good nutrition is important for kids to develop and grow. For more click here. Now that we know all these fun facts about Florida dairy, let’s talk about Frozen Hot Chocolates and celebrate National Dairy Month with a sweet boozy treat. What is Frozen Hot Chocolate? Why is it so famous? and How is this recipe over the top? When trying to decide what recipe to create for the Florida Milk campaign, I looked through old pictures for inspiration. 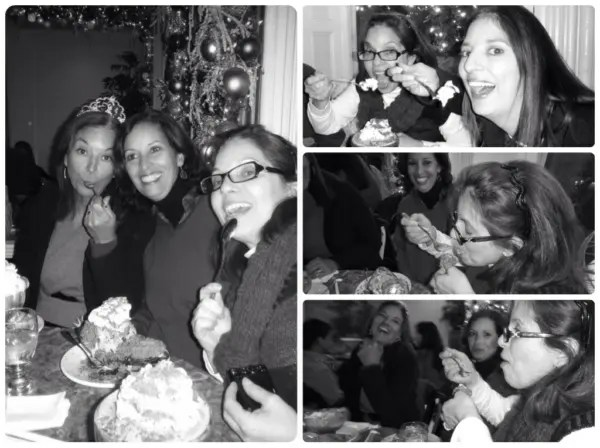 The ones of my sisters, nieces and I enjoying ginormous ice cream sundaes and dairy treats at Serendipity 3 during the most unforgettable girls weekend in New York City instantly caught my eye. One particular treat stood out – the most famous of them all. The Frozen Hot Chocolate. 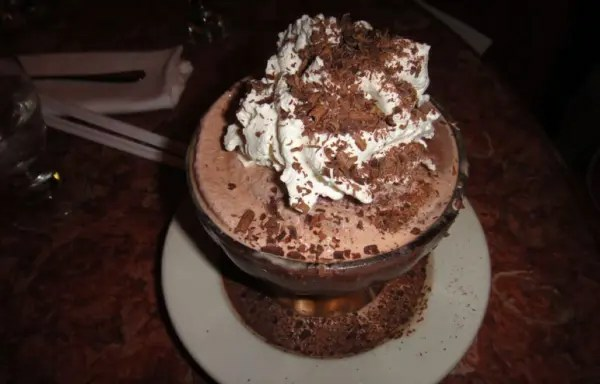 The mention of Frozen Hot Chocolate instantly conjures thoughts of 2001’s romantic comedy ‘Serendipity’, where John Cusack and Kate Beckinsale’s characters fall in love over chocolatey sips at this iconic New York restaurant. You may think the movie made the drink famous. In reality, it was famous since it’s creation in 1954. Jackie O wanted the recipe. Oprah even named it one of her favorite things. And yet, I still didn’t quite understand the hype. For more than 6 decades, this restaurant has drawn long lines of fans. Us included. As we stood outside on a cold New York night, waiting to be seated for almost two hours, all I could think about was “this frozen hot chocolate better be good. No. It better be great!” Such build up could only lead to let down. There’s no way iced chocolate milk (so I thought) could be THAT good. We were finally seated in the kitschy space with Tiffany lamps, antiques, and funky clocks. We ordered several outrageous ice cream sundaes and of course, what else? These fantastic goblets overflowing with dairy goodness and mounds and mounds of whipped cream arrived to the chorus of “oohs and aahs”. Bite after bite, sip after sip, we did nothing but laugh, giggle like schoolgirls, make funny faces and for a brief moment, became kids again. No worries in the world. All of us, enjoying the simple things. Frozen decadent treats. What an amazing time. And to think, it was all prompted by frozen hot chocolate. Was it worth it? Was all the hype and the long wait time worth it? Those memories of the time we spent together, around the table, are absolutely priceless. I look at the pictures, now missing my sisters more than ever. What I wouldn’t give to be able to go back to that pink marble table. 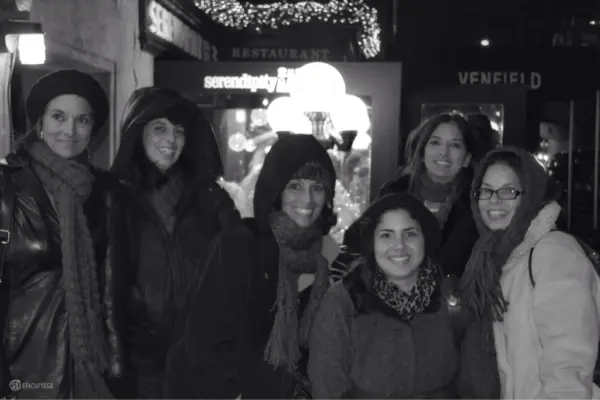 To that moment on December 10, 2011, with my dear sisterhood, frozen hot chocolates and laughter. A frozen hot chocolate conjured priceless memories. Milk, Chocolate, and Whipped Cream – simple yet so much more. This, I suspect, is why couples fall in love at Serendipity. It’s an experience fueled by the shared love of frozen dairy treats! When all was said and done though, this famous “Frrrozen Hot Chocolate” was not my all time favorite that night. Don’t get me wrong, it was good, and we loved every minute spent slurping it down. But it was missing just a little something. And I wasn’t sure what that was. Fast forward to 2016. The family spent the day at the beautiful snowy retreat of Mt. Hood’s Timberline Lodge, just outside of Portland Oregon. Sipping hot beverages like the house specialty ‘Bruno’s Brownie Hot Chocolate’, made rich and creamy with whole milk and chocolate, and given a little boozy kick with local hazelnut vodka, Bailey’s Irish Cream and Cointreau orange liqueur was truly outstanding. I wanted to recreate it as soon as I got home to Florida. But, unless I cranked up the AC to stratospheric proportions, there’s no way I would enjoy a hot beverage in the heat of summer. That’s when it hit me. Make it into a frozen beverage. But wait, was booze what was missing from that frozen hot chocolate years ago? I decided to give the Frozen Hot Chocolate another try. And oh my! A boozy Hot Chocolate could only be better made frozen! I don’t advocate adding booze to everything. This indulgent drink can be made non-alcoholic if you choose. Yet, liqueurs provide layers of flavors difficult to recreate with flavored syrups. Plus, they definitely add some fun when friends get together. As a 2% milk girl, I weaned myself, and my reluctant husband, down to 1%, and then non-fat milk following the trend towards reduced fat. Whole milk never made it to the grocery list. Then, I discovered how fantastic whole milk was in lattes and cocktails. Now, I indulge, every once in a while. The creaminess and rich velvety feel on the tongue are hard to match. 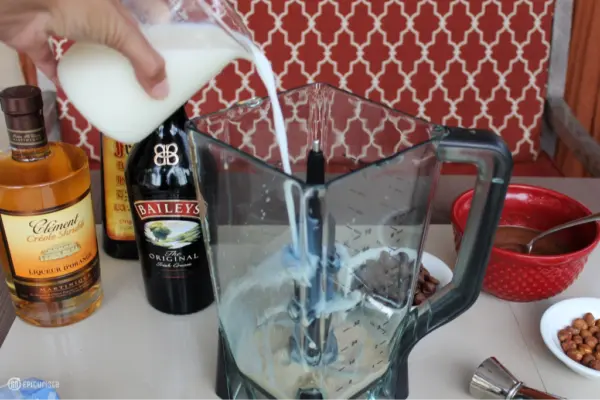 I used whole Florida milk in this Boozy Hazelnut Frozen Hot Chocolate recipe, but of course, you should use whichever milk type makes you happy. Interestingly, I read an April 2016 article in Time Magazine about an ongoing debate whether whole milk is as bad for you as it was once deemed to be. Isn’t every diet trend eventually debunked? Instead, my philosophy is ‘everything in moderation’ and, that applies to both booze and whole milk. Here’s a little secret. A true frozen hot chocolate is not iced chocolate milk as I thought. It’s not a chocolate milkshake, and it is not made with ice cream. According to the coveted Serendipity recipe, kept secret for 50 years and published in the 2004 ‘Sweet Serendipity’ cookbook by founder Stephen Bruce, it is made with a blend of melted chocolate and hot chocolate mix – you know, those little hot cocoa packets you get at the store! The recipe from Serendipity calls for a variety of chocolates. 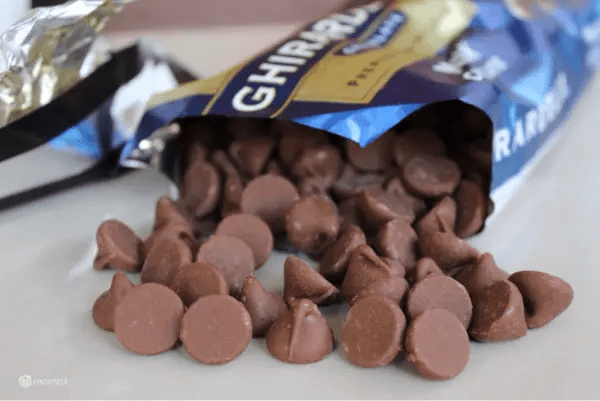 I used Ghirardelli 60% bittersweet chocolate bar cut into pieces and Ghirardelli Milk Chocolate baking chips. The combination of bittersweet and milk chocolate provides the rich chocolate flavor and the sweetness. I reduced the amount of additional sugar since the original recipe doesn’t use liqueurs. These add plenty of sweetness. Feel free to adjust to taste. 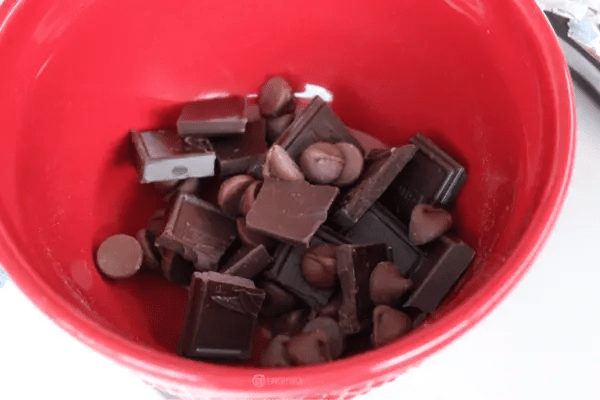 Melt the chocolate in a double-boiler on the stove or use the microwave. I did the later as I find it easier and faster. Perfect for Easy Entertaining! In place of hazelnut vodka, I used Frangelico, an Italian hazelnut liqueur. Clement Creole Shrubb orange liqueur from Martinique in place of Cointreau. Bailey’s Irish Cream has no substitute in my book. Choose your favorite brands, but like the milk and the chocolate, high quality ingredients make the difference. The orange liqueur may be omitted but I found it gives it a nice little zest of flavor, just enough to liven up the nutty flavors. 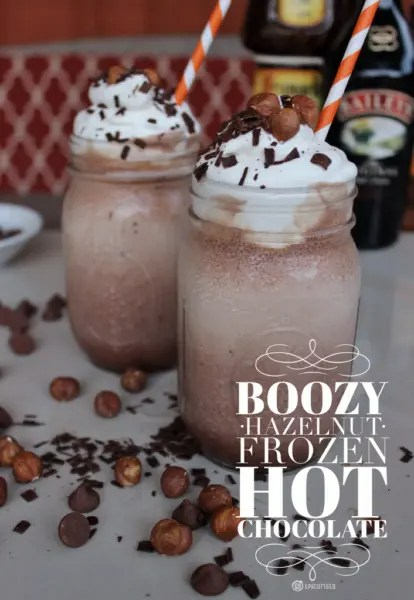 Make your hazelnut frozen hot chocolate non-alcoholic my substituting liqueurs for hazelnut syrup from your local coffee shop, Bailey’s flavored coffee creamer, and orange extract or zest. You have two options. Go the easy route and use the store-bought real whipped cream or make your own for a more decadent experience. It’s also better for you as you don’t have the artificial additives, just rich heavy whipping cream. The trick here is that it must be super chilled. 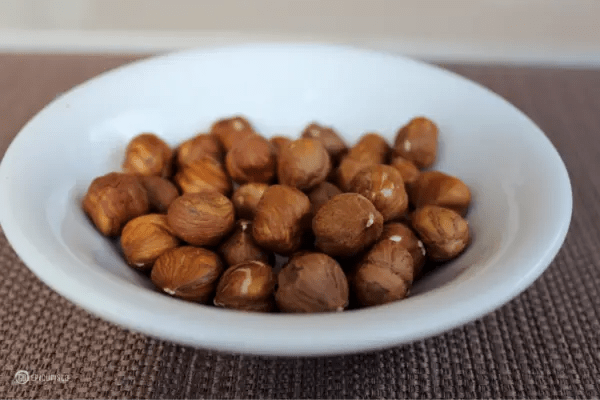 Did you know 99% of the hazelnut production in the USA comes from Oregon? 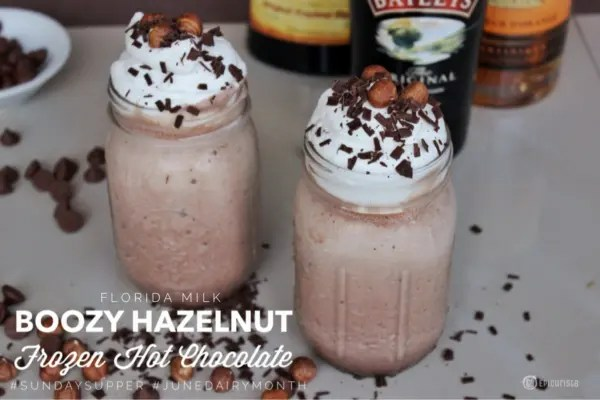 Using roasted hazelnuts as a garnish together with Florida dairy was like my life marrying my two favorite states – where I was born and where I live. That’s exactly what this boozy hazelnut frozen hot chocolate is. Decadent, indulgent and topped with mounds and mounds of whipped cream. A creamy dreamy blend of chocolatey goodness. This recipe is perfect to end a Sunday Supper meal or for a fun gathering of girlfriends who want to go back to simpler times. Surprise them with this boozy frozen concoction and prepare to laugh like schoolgirls all over again. Disclosure: This post is sponsored by Florida Dairy Farmers in conjunction with a social media campaign through Sunday Supper LLC. All opinions are my own. As always, I only share with you great experiences worth celebrating. 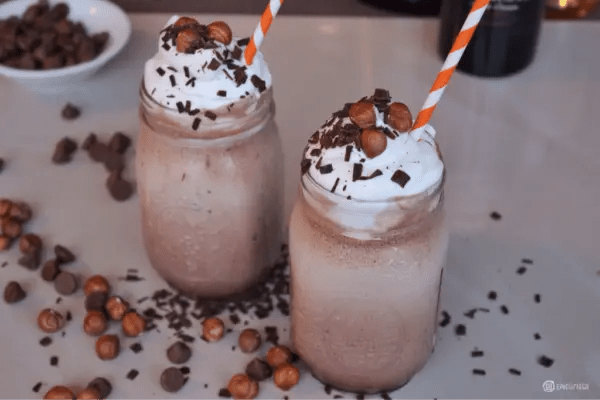 This boozy hazelnut frozen hot chocolate is even better than the original famous version! Creamy, chocolatey and a bit boozy, it's perfect for a fun night with friends! Easy to make with great quality ingredients like Florida Milk and Chocolate! Prepare homemade whipped cream (see recipe below), cover with plastic wrap and hold in refrigerator until drinks are ready to be served. Combine sugar, dry milk powder, cocoa powder and salt in small bowl and stir to combine. Place chocolate pieces in a microwave safe bowl and melt in 15 seconds increments, stirring each time, until completely melted. Add the dry ingredients to the melted chocolate and stir to mix. Slowly add ½ cup of milk and stir until smooth. Cool to room temperature. Pour liqueurs, remaining cup of milk, room temperature melted chocolate mixture and ice in blender. Blend on high to achieve your desired consistency. Think of a frozen daiquiri or frappe consistency. Use a vegetable peeler in long strokes along the edge of the chocolate bar to create chocolate shavings for garnish. 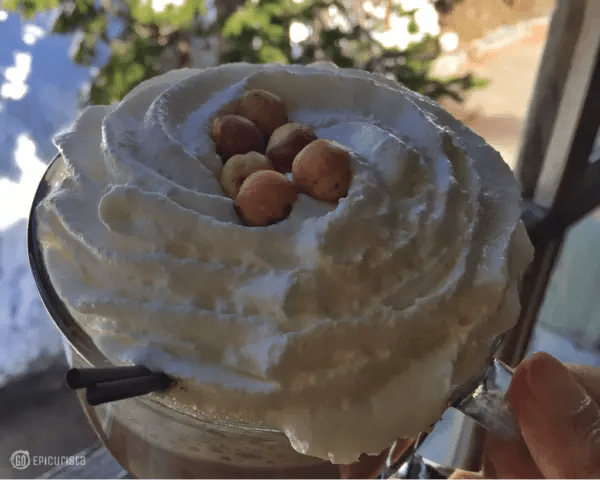 Pour frozen drink into a giant goblet, large mason jar or mug and top with a large dollop of whipped cream, chocolate shavings and roasted hazelnuts. Combine cream, sugar and vanilla in a chilled bowl. 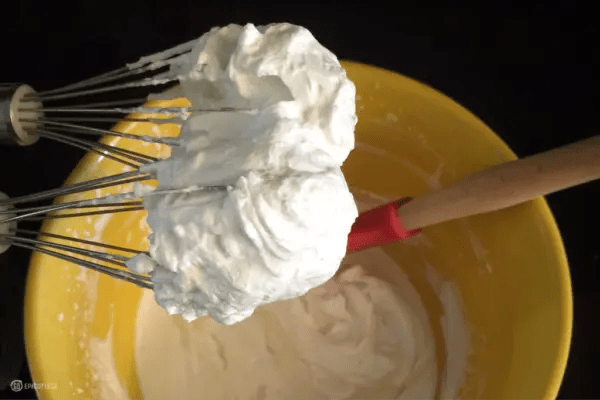 Using an electric mixer with whisk attachment, whip the cream mixture on medium speed, until cream holds soft peaks. Dollop on top of your frosty beverage and enjoy! Wow! This looks decadent and totally drool worthy! Cheers. Thank you for stopping by Go Epicurista! I hope you will get a chance to share a boozy frozen hot chocolate with friends soon! Cheers! Girls Night In for sure! Thank you for stopping by Adriana. Hope to share a cocktail with you soon! Decadence can still be good for you! Perfect way to get your dairy daily allowance. Cheers! Oh my goodness, this look amazing!! Thank you Marye! I appreciate you stopping by Go Epicurista. Hope you will come back and visit the site for more inspiration and Easy Entertaining ideas. Cheers! It’s definitely an occasional treat but oh so worth it! It can make any day a special occasion! Cheers! This is definitely a cocktail to make when the kiddos are not around! It’s seriously an adult “kid’s treat” Cheers! Oh my god. I haven’t tried the infamous Frozen Hot Chocolate at Serendipity (I’m ashamed to say I’ve never been!) but after reading your description, I feel like I was right there, giggling along with you and your family. You painted such a beautiful picture…. and made a beautiful version of your own! Obviously love the addition of liquor 😉 These sound delicious! Thank you so much Shaina! It’s amazing how one can be inspired by a drink and a drink can evoke so many memories. I can’t wait to make this version for my sisters to enjoy the next time I see them. I hope you will give it a try and create your special memories with friends too! Cheers! Shelby that must have been such an experience living in a dairy farm. I would love to go visit one and see all the behind the scenes. It makes you appreciate the food you eat so much more when you know where it comes from and all the effort that goes into it. I hope you will give my frozen hot chocolate a try and have some fun reminiscing. Cheers! I’m with you, I’d totally do for the whole milk with these lovelies! I think I might have everything I need to make these tonight! Thanks for sharing this recipe! I can’t believe I poo pooed whole milk for so many years. It truly is amazing in these kinds of recipes. This Frozen Hot Chocolate is so easy to make and great to whip up when friends come over. Everyone will be laughing and smiling! Cheers!